Innovative business model designed to help remove the current bottleneck in biological therapeutic product realization due to severe shortage in comprehensive quality management expertise in China. 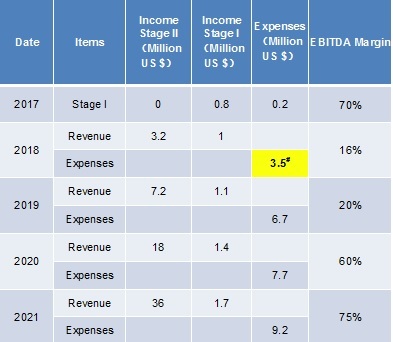 Revenue-positive, founder funded for the first 14mo of operation, and growing with clientele representing the most advanced biological therapeutic product platforms in China. 100-200% annual growth in revenue anticipated for the next 4 years. Looking for investment to expand business of the GMP QC testing center already in operation. The company provides state-of-the-art international Quality management concepts and build them into quality systems for biological therapeutics development companies. The company offers bilingual services such as strategy, system building, training, leading execution on-site, and continuous improvement. Company’s comprehensive Quality management services are usually long term endeavors and solve the common problem of lacking sufficient expertise in all aspects of Quality management for most of the emerging biologics therapeutics companies. Quality Control (QC) testing centers are being set up and operated in compliance with global GMP. Phase I lab is in Shanghai and already operational. 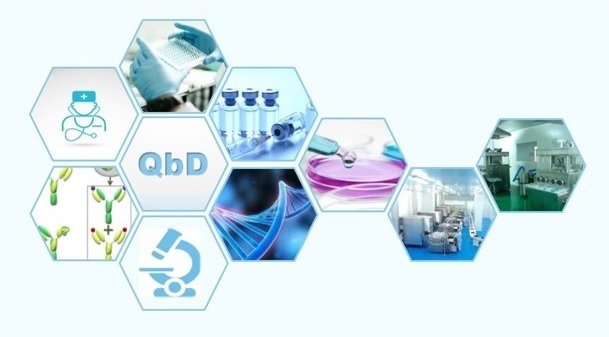 The testing services will cover all common and customized QC methods used in the fastest growing therapeutics in China and the world such as monoclonal antibodies, CAR-T, etc. Related services such as cell bank testing will also be provided. Quality service plans are customer designed for each client, and a total price is charged per contract. Services are then provided based on project goals, product status and milestones with an upfront payment and milestone payments. Company’s clients include leading biopharmaceutical companies in China with exciting product pipelines e.g. monoclonal antibodies, biosimilar and novel, antibody-drug conjugates (ADC), cell & gene therapy, e.g. CAR-T etc.). Compared to other biologics companies, investing in this company carries much lower risk, with faster & significant returns on money invested. The Company is already shaping up to be an international-caliber quality management team with the founder and CEO, and her hand-picked experts in various areas of quality management. The founder CEO’s extensive scientific and CMC expertise, along with her corporate senior leadership experience, has attracted several seasoned Quality experts such as Dr. Xiao and Dr. Huang to her team. In addition, The founder CEO has also recruited high-potential managers who carry out the operational responsibilities in QA, QC and validation areas for their clients and their own testing centers. These qualities make the company a growing magnet for other aspiring biopharmaceutical Quality professionals from US and China alike to join. Hence, it has the potential to evolve into one of the strongest biopharmaceutical Quality leadership teams in Asia. Under the Chinese government’s 12/5 “National Policy on Mid-Range Industrialization Focus”, and the “Promotion of Biologics Product Development and Commercialization Policy”, as well as 13/5 “Biological Technology Development Plan,” innovative biopharmaceutical companies have been undergoing tremendous growth in recent years. However, imported bio-therapeutics remain dominant (>80%) on the Chinese market, and mostly supply only the high-end private hospitals and very few rich individuals. Majority of the biopharmaceutical products produced by Chinese companies have not reached the global market due to poor quality and low efficiency. 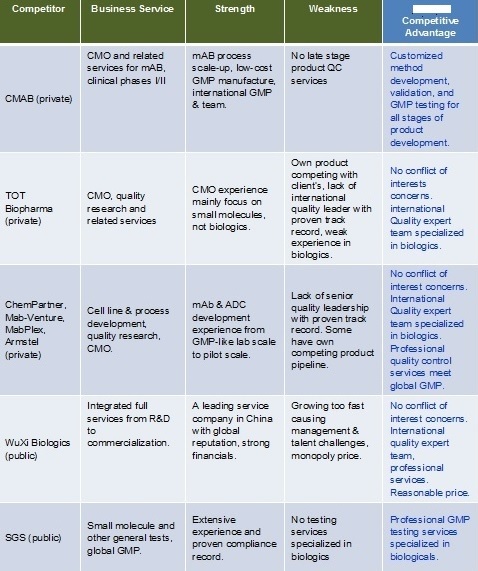 Up to 2017, although the number of Chinese companies in monoclonal antibody drug development reached 277, with IND applications for 189 product candidates, the fate of these product candidates during clinical development is highly unpredictable due to lack of understanding and experience in GMP manufacturing and Quality in China. The Company’s business is built to tackle this serious industry-wide problem, by providing full service Quality management services covering all aspects and throughout entire product life cycle. The addition of GMP testing center would further expand the scope of their services into highly specialized Quality Control activities. The Company is well positioned and committed to contribute to the advancement of the bio-therapeutics industry in China. #: Looking for 3.2 m US$ In Series A Financing, and 0.8m of 3.2 m would come from reinvestment and government support. 2018 Series A fund would allow continuous company growth for the next 4 years. Competitive Landscape Analysis: There are no direct competitors. Early 2022, the company plans to either go IPO for continuous business expansion, or to sell its business through acquisition.